This search engine optimization tutorial is for you if you have a website, you want to know how to get listed higher in Google and other search engines AND you like your info in plain English, not techie jargon. In this free tutorial I provide a 'real person, non-techie' look at the SEO basics you need to know to get free visitors. Before we get started with the SEO basics, have you submitted your website to Google and Bing yet? If not, click here to get listed on google. It's free to do and will take you about 5 seconds. Why do this first? In order to move UP in the search engines you first need to be listed IN them. Okay, let's get this search engine optimization tutorial started! The first thing you need to know is that you CAN do this. Don't get overwhelmed by some of the terms you may not be familiar with or think it's too techie for you. It isn't. I've taught 92 year olds this stuff and if they can get it, you can too. Also know this: it's MUCH easier to actually do it than to read about it - kind of like sending an email. Imagine how hard that would seem if someone was explaining how to do it the first time but how simple it actually is. This is like that. Search Engine Optimization (called "SEO" for short) is just a fancy way of saying your website is arranged in such a way that it shows up high in the search engines. The better optimized (i.e., arranged) your website is, the higher it appears. There are several parts to search engine optimization. We're going to take a look at the 4 most important ones. I will give you the info you need to care about for each of these items later in the tutorial. Keywords: This is the search term you are targeting on your web page. It's what you want visitors to type in to get to your site. For example, the keyword for this web page is "search engine optimization tutorial." Meta Tags: These are items in the hidden code of your web page and except for your web page's title is just for search engines to see. This is one of the places you put what your web page is about. On Page Optimization: In this part you simply add the keyword you have chosen to your web page. Outside Links: This is the only part of the seo process that is not entirely in your control. In order for Google to know what your web page is about it looks not only at your web page to see what it's about it ALSO looks to see what other websites say your web page is about. It looks at the links coming IN to your web page to see what other people think your web page is about. For example, this web page is an SEO tutorial. If other websites link to this page and in the link on their website put the words "SEO tutorial" and the components on my page tell google that this page is all about "SEO tutorial" then Google thinks "Ah-ha! That page is about SEO tutorial!" so my site will rank higher for a search of SEO tutorial than websites that either a) don't tell Google what their web page is about and/or b) don't have other webmasters linking to their web page to tell Google what their web page is about. Okay, now you know the SEO basics, let's take a closer look at each of these 4 parts so you can see exactly what to do for each part to improve your own website's rank. Also, I give you some real world tips and some do's and don'ts in each section so you don't end up screwing up your search engine optimization without realizing it. Click here to go to Step 1: SEO Keywords. 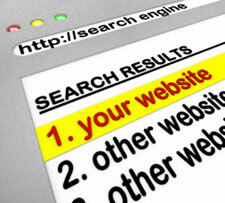 Why Should you Care about Search Engine Optimization? - This article gives you a breakdown of the competitors you face and how you can get higher in the search engines by doing basic seo. Disclosure: I receive payment from about 25% of the companies mentioned on this site.